Streaming itself can be hard and it’s even harder to keep track of everything during the stream when it comes to follows, subs, etc. Arsenal.gg made it super simple though by breaking down your stats in every area, including during any game that you’ve played. They made it very easy to showcase where your strengths lie and where you can use some improvement. Lightstream recognized this and decided to acquire them for the future. Arsenal, as stated before, makes keeping track of all things simple and efficient. Ever wanted to know what your strongest gameplay was? Or wanted to know when you had your highest viewer count? Or maybe you wanted to see the steady growth progression of your stream to make some predictions for the future? Arsenal offers this and more. It even offers Game Publishers and Studios a chance to see how well their products are doing on the market and where they can start focusing their efforts for later use. This is usually a daunting task, needing hours of dedication to research but Arsenal has wrapped this into a simple package. 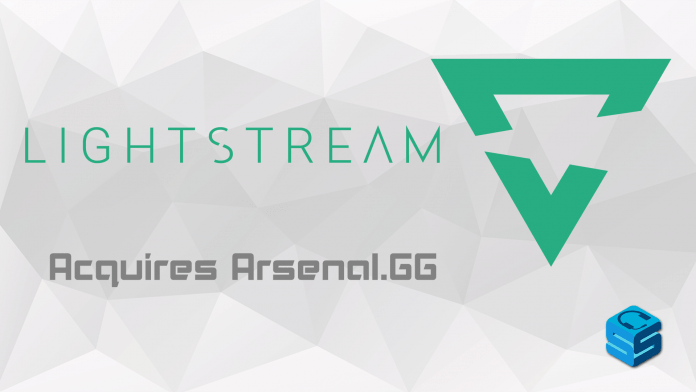 With Lightstream, they developed a all-in-one simple streaming solution to get started streaming fast and efficiently. It offers tools to enhance the visual and audio perspectives, providing tools and widgets to the streamer. Best of all, Lightstream runs off of Cloud-based technology, making the ability for almost any system to become a strong streaming machine. Stu Grubbs, CEO of Lightstream, is very excited about this acquisition. He speaks about how efficient Arsenal is and how statistics used to be a spreadsheet or self-reported data. Lightstream is ramping up for a big 2019, already hiring a new CTO in Jenny Farver, a new Community Manager in iamBrandon, and acquiring Series A funding to enhance the program further.